15 boats entered the third Snipe Open at Bough Beech sailing club since fleet 545 moved there from Blue Circle. The fleet comprised of 8 local boats and 7 travellers from as far afield as Manchester and Devon. Saturday brought a surprisingly decent amount of wind considering the forecast had looked bleak for the whole weekend, although the consistency was lacking. At its Peak the wind reached around 8 knots however in some of the lulls we had almost nothing. Big wind shifts of up to 30 degrees made the conditions even trickier. Despite the difficult conditions the race officer, Mark Stone, and his team did a sterling job. We Sailed 6 races on the first day in case the wind on Sunday was as bad as forecast (which turned out to be a good call). The Racing was very close all day with the conditions allowing big gains and losses meaning being in the right place at the right time was vital. We saw a different winner in every race on the Saturday with Alan & Liz, Ian & Mike, Guy and Alison, Mark & Tracy, Alex & Myself and Peter & Jenna all taking a win. Consistency turned out to be the key on the first day although the battle for top spot was very close with Peter ahead of both Mark and Myself by only 1 point. Dinner that evening was a fantastic chicken curry thanks to Tracy & Mark in the galley who had also provided us lunches to take on the water for those that wanted them. Sunday morning and the lake appeared glassy as predicted so a time limit of 12.30 was set to decide if we would race that day or not. At around 11.30 a little wind started to appear sporadically across the lake so Mark & Emma went out to test the conditions. By 12.15 the wind was looking a little more consistent so at 12.30 the fleet decided to go out and try to get 1 or 2 races in. For a while we had a reasonable wind but by the time the race started at 1.00 it had died of to basically nothing again. 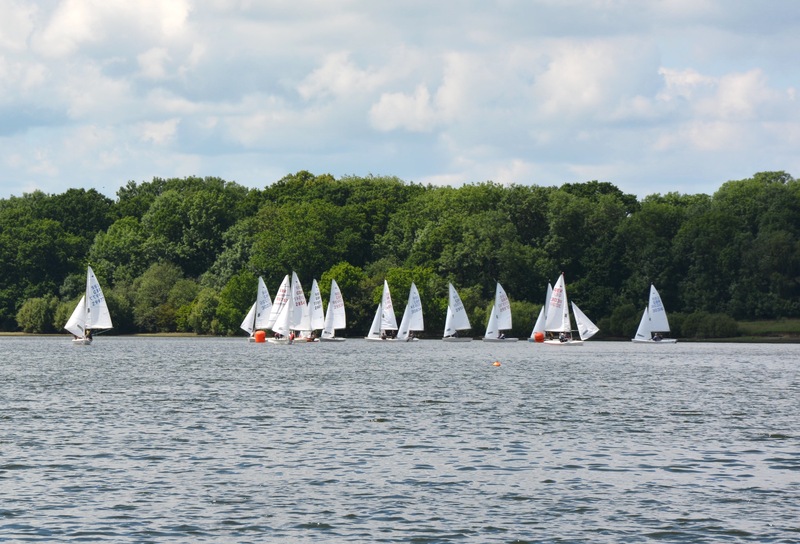 These conditions stayed for the rest of the race which Peter & Jenna won to consolidate their event win while Mark & Emma took second to secure the same position in the Regatta. Alex and Myself finished back in sixth however we had done enough to complete the podium and finish first Junior. A huge thank you to all the race team, the galley, the club representatives and the participants for making the event such a good one. Hope to see you all at Blackwater on the 30th of June and 1st July.